A study has been published in the journal Écoscience assessing the impact of pink-footed geese on arctic tundra vegetation on Svalbard, Norway. 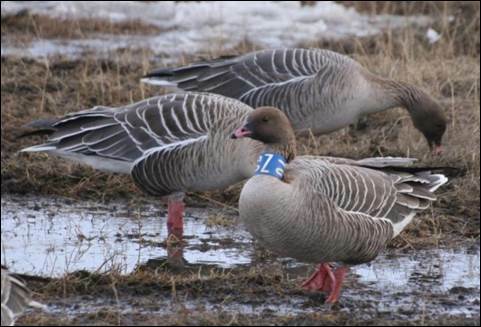 Monitoring and assessing the impact of pink-footed geese on arctic tundra vegetation is a fundamental part of the ISMP. A study has been published describing and assessing the extent of arctic tundra degradation on Svalbard, Norway caused by grubbing, where pink-footed geese forage for rhizomes below-ground. The study assessed grubbing extent (occurrence of vegetation disturbance) and intensity (proportion of vegetation disturbed) in 2006/07/08 when goose numbers were approximately 56,000 and in 2013 when they increased to approximately 81,000. Further details of this study are available on the Publications section of this website.